These videos demonstrate well what I like so much about John MacArthur, and why I am beginning to appreciate Kirk Cameron more and more all the time. What is most amazing about these videos, however, isn't that MacArthur says what he says on television. We are used to seeing him faithfully proclaim the Gospel on TV shows like Larry King Live, for example. But these videos are taken from an interview on TBN! Do the people who run that network even realize that virtually everything Cameron and MacArthur say is an indictment against them? I guess the complete lack of discernment by those who run TBN has worked in favor of the truth for a change. I just pray that the Holy Spirit will open their hearts to this truth. I saw this video over at InternetMonk.com and thought it was humorous. The song, "I Think My Wife's a Calvinist," is by Brandon Milan. His wife, Leah, helped him write the song and is the one playing the mandolin. Personally, I am glad my wife is a Calvinist, but I guess that's because I am too! So here’s where “the rubber meets the road.” It’s one thing to affirm one’s commitment to sola Scriptura and offer a general warning against an imbalanced commitment to one’s Confession of Faith. Most won’t object too strongly. It’s quite another thing, however, to venture suggestions as to how one’s Confession of Faith might have some deficiencies that need improvement. I don’t expect that all my readers will fully agree with all of my suggestions—at least immediately. But I do hope that you’ll give the matter careful prayer and reflection. In general, I think there are at least three ways in which the 1689 London Baptist Confession can be improved. The three areas of improvement Gonzales goes on to suggest are: 1) "updating the language of the confession," 2) "adding theological affirmations to the confession" (such as a clear statement on the Biblical roles of men and women), and 3) "making modest refinements to some doctrinal formulae" (such as "fine-tuning" some of the confession's statements about covenant theology). So far, to my knowledge, he hasn't written anything more specific to date, although I certainly hope he does so soon, because I think he would do a very good job. As for Gonzales' suggestion that we update the language of the confession, some attempts at this have been and are being made, as I indicated in my January 3 post about Modern Versions of the Baptist Confession of 1689. But today I would like to begin a series of articles offering some suggestions about the other two areas mentioned by Gonzales, namely "adding theological affirmations to the confession" and "making modest refinements to some doctrinal formulae." My goal in writing these articles is not stir up controversy or debate – although I am not so naive as to think this unavoidable – but rather to encourage what I believe is a necessary and potentially fruitful discussion. At least I hope it will be a fruitful discussion. I transcribe the text of the chapter with additions. My suggested additions are in italics along with the suggested Scripture proofs. Locations within the larger confession that support the suggested additions are discussed beneath each respective paragraph. 4. We, therefore, affirm and have joyful confidence in these indivisible truths: the gospel is the only outward means of revealing Christ and saving grace, and is, as such abundantly sufficient thereunto; yet that men who are dead in trespasses may be born again, quickened or regenerated, [omit semi-colon and insert comma] there is moreover necessary, beyond the mere persuasive power of bare truth, an effectual insuperable work of the Holy Spirit upon the whole soul, for the producing in them a new spiritual life; without which no other means will effect their conversion unto God. [Psalm 110:3; 1 Corinthians 2:14; Ephesians 1:19, 20; John 6:44; 2 Corinthians 4, 4, 6] The substance of all missionary and evangelistic labors, therefore, must be the proclamation of the Gospel. Apart from this message we may not expect God’s Spirit to honor our efforts with the reclaiming of the lost. In the context of such labors one may always hope that the Spirit will lead the lost to Christ. An addition such as this would be consistent with the full light of Scripture truth, the historical flow of Baptist history, and the internal implications of the Confession itself. For at least a two-fold purpose such an addition holds promise for edification and conscientious discipleship: One, we should articulate a clear theological motivation for personal and world-wide evangelization, avoiding the error of the hyper-Calvinist; Two, we must help correct the tendency to abort evangelism from its theological womb but must insist that it be nurtured and matured and kept alive by its fructifying connection with the whole of doctrinal truth. The added emphasis suggested by Gonzales could easily be inserted into what Nettles has himself offered, and in my view would make a good proposal that much better. What say you? 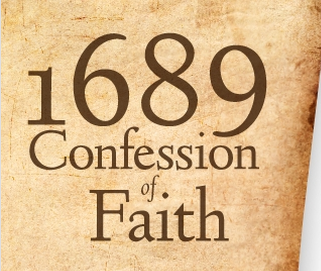 1) The Founders Ministries website has made freely available online A Faith to Confess: The Baptist Confession of Faith of 1689 Rewritten in Modern English ©1975, Carey Publications, Ltd. I have long wanted to update the language of the 1689 Confession to make it more accessible to modern readers. I'm aware of other modern versions, but I object to the cost and copyright restrictions on the Carey edition (the most widely available version), and I've found that none of them seem to be very consistent in the way they approach the update. For example, the Carey edition seems to be nothing more than a paraphrase in some places and yet quite stilted in others. I approach this whole thing with fear and trembling, and that's why I'm putting this on the web. I fear inadvertently changing the doctrine or confusing something that was clearer in the original. So I'm posting my attempts at an update so that folks can comment and make suggestions and corrections. My goal is to maintain the structure and language to the extent that these lend themselves to clarity to the modern reader. When they don't, I will consider modern equivalent terms or rephrasing. In more difficult cases, I may rework the structure of a paragraph if it can be stated in a significantly more natural way in modern English without compromising the meaning. I don't pretend that the result will be readable on a 6th-grade level. The concepts in the confession simply don't lend themselves to such simplistic expression. Furthermore, I don't want to change well-established theological terms unless I judge that they are fairly obscure and can be greatly clarified by a modern expression. As I wrestle through the rewording, I will be referencing and learning from the Carey edition, the Kerkham edition, the Masters edition, as well as the original, including the facsimile copy published by B&R Press. I expect my version to be sufficiently different from all the other modernized versions that there will be no violation of copyright. I've included links to electronic versions of the ones I'm consulting, except for the Masters edition, which I haven't found online. I relish all constructive comments. I may not be able to respond to all comments or explain my reaction to them, but I will do my best to read and consider them. Until I've finished all the edits and released a final form, I claim a copyright on the work in progress and do not grant permission to make copies. I will eventually provide permission to copy under certain conditions once I've finished it.